This is a lively and participative course open to people with any kind of interest in Latin America. The course gives participants insight into the causes and consequences of social justice and human rights issues in the region. Participants will acquire a general understanding of Latin American social, political, historical and economic contexts as well as more detailed learning on topics of contemporary significance, such as globalisation and trade; labour issues; migration; struggles for indigenous rights; environmental and climate change problems and threats; feminist and gender rights movements and other popular resistance. 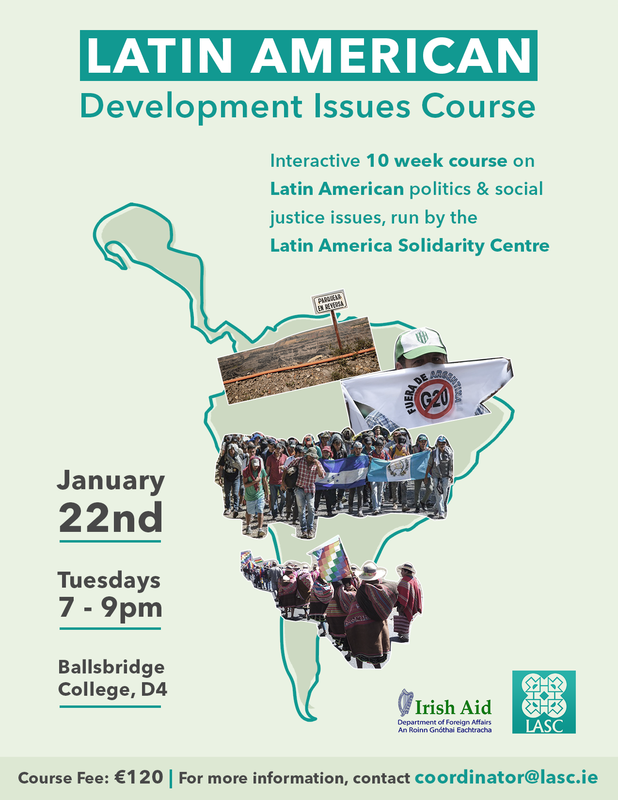 Participants will become familiar with many of the issues facing people in Latin America, how they have responded to them and how these problems relate to Ireland and the rest of the world. This course carries a QQI Level 5 Minor Award, and participants who complete the assignments will receive a QQI Minor Award certificate. Academic credits achieved with a Minor Award can contribute towards achieving a Major Award, as well as being an achievement in their own right. The course will be run on Tuesday evenings from 7 – 9pm in the Ballsbridge College of Further Education on the Shelbourne Road in Dublin 4. If you would like more information you can email the LASC Coordinator, Sian, at coordinator[@]lasc.ie. What's your main interest in Latin American issues? On clicking submit, you are registered for the course, but enrollment is not complete until the payment of €120 is made. You can pay by the following means: Through Paypal, to the account coordinator[@]lasc.ie Through bank transfer, to Bank of Ireland Account name: Latin America Solidarity Centre Bank Code (BIC): BOFIIIE2D IBAN: IE37 BOFI 9000 8475 9890 44. If you have any difficulties completing payment, please email Sian at coordinator[@]lasc.ie.